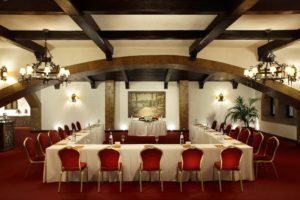 The conference venue is the well-known 5-star Royal Olympic Hotel located only a short walk from the Acropolis and right in front of the Temple of Olympian Zeus in the heart of the historical city center of Athens. Boasting one of the most picturesque rooftop terraces in Athens, guests can enjoy the stunning panoramic views overlooking the Acropolis and Lycabettus Hill as well as the National Gardens. The venue is only a 2-minute walk to the new Acropolis Museum (where the SLT 2018 Gala Banquet will be held). 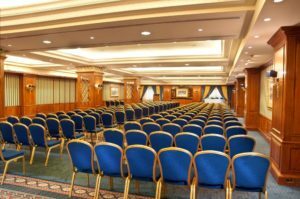 The venue is one of the best equipped conference hotels in Athens offering 18 fully equipped and recently renovated meeting rooms, all flooded with natural light and accommodating up to 700 guests in total. Free WiFi access is provided throughout the hotel, while the multilingual staff is available 24/7. Most rooms offer views over the Temple of Zeus or the swimming pool and garden. A library and business center are also available onsite. The hotel offers 270 stylish Executive rooms as well as Suites with friendly and professional members of staff. A fully equipped gym along with a spa & wellness center and a swimming pool are available for guests. In 2007 the Royal Olympic Hotel extended its conference assets by creating five brand new meeting rooms which are flooded with day light and four of them have the option to be divided into two separate rooms that are sound proof, have separate entrances and have all audio visual and technological facilities (such as WiFi, UPS, etc). A new separate Conference Reception, supported by an office (about 100m2) and a store room, lays at the ground floor attached to the main lobby area and will be used for the purposes of the SLT2018 conference. Additionally, the hotel provides full audiovisual equipment with support from their own professional staff members. All public areas include WiFi service and a private meeting space for 5-15 people may be arranged. An ultra-high speed WiFi connection (optic fibres) is freely available throughout the hotel, in all meeting spaces and guest rooms. All meeting rooms are soundproof and equipped with all required audio visual and technological facilities (such as WIFI, UPS, sound speakers etc.). Additional equipment is available at an extra charge according to conference requirements. The conference venue is located less than a 2-minute walk from the closest metro station (“Acropolis“) and less than a 10 minute walk from the central “Syntagma Square” stop allowing for maximum guest mobility. Additionally, there are excellent bus and tram connections that serve the area leading to either the surrounding city centre or to the beach front. The hotel is easily reachable by METRO / UNDERGROUND / BUS service in approximately 1h 30mins from Athens’s International Airport “Eleftherios Venizelos”. BUS tickets (one-way) to central Syntagma sq. cost 5 euro. The TAXI ride from the airport takes approximately 1 hour at a cost of 35-50 euro depending on traffic and the time of day.